Good Monday morning everybody! It is always such an honor when clients return for more photos, especially my couples! When Megan reached out to me about family photos, I was so excited! I always say it’s one thing to impress the bride, but it’s another to impress the family! 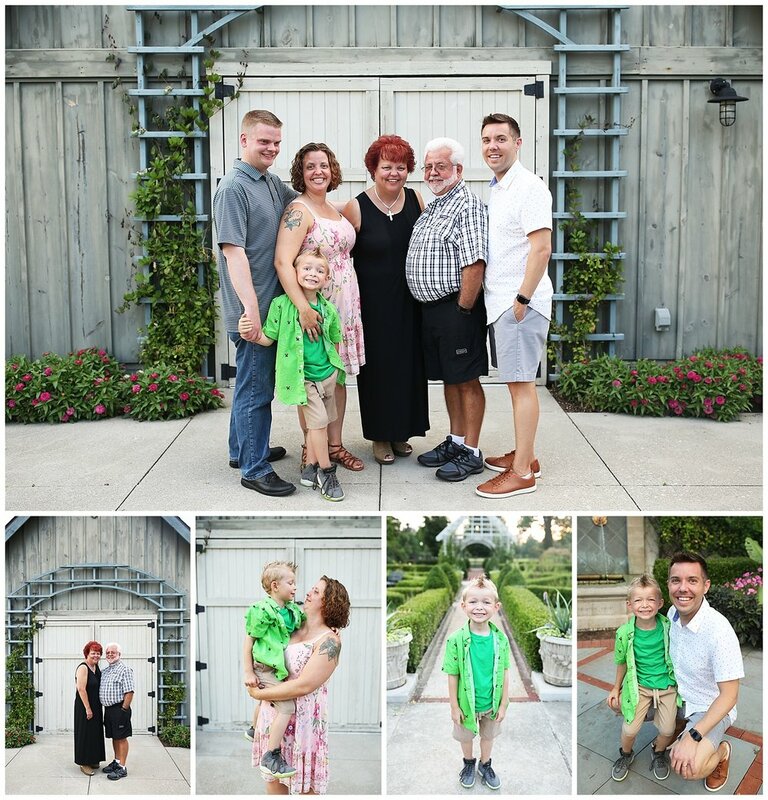 So, when Megan’s whole family was up for portraits, I was so happy because I know that means that they loved the images from Megan and Aaron’s wedding too! I shot Megan and Aaron’s wedding last summer and their engagement photos the year before! I absolutely love the relationships that I have with my clients. God has seriously blessed me by introducing me to some incredible families through this business. These family photos include Megan’s immediate family, with her parents and brothers and sister who I remember well from their wedding day, along with her sister’s sweet new baby girl, and her aunt and uncles and their beautiful children, and even her adorable grandparents (seriously, they are a d o r a b l e !)! Holy mackerel! It's MAY! How did we get to May 2018?? My 2018 seniors are graduating so soon, my busy season has officially begun. I am so excited, y'all! Alright, guys. I just want to make this clear: I always want to be that photographer you go to when you want photos of your pups! I was SO EXCITED when Laura reached out for portraits, and the main reasoning behind these photos was to celebrate her and Steve's sweet beagle puppy Leila's first birthday! Besides shooting weddings, I also love getting to shoot baptisms! This is my second baptism I’ve had the opportunity to shoot. I was so excited when our friend Anna Lea asked me to photograph her sweet little boy’s baptism. Baby Yianni was baptized at the Greek Orthodox Church in Columbus., our home church It is so amazing to witness this beautiful sacrament. Happy Friday! My first wedding of 2018 is tomorrow and I am so excited!! For now though, I’m taking y’all back to the fall for the Krukowski family photos with Heidi and Eric and their two precious furpups! Happy Tuesday! I met up with Hannah, Jordan, and Sam last fall on a cold morning at Scioto Audubon Park for their family session. Hannah and I were both ice skaters. We even did Columbus Blue Jackets Ice Crew a few seasons together and went to the same high school so it was really fun to catch up with her and meet her super sweet little family. I absolutely loved her little boy, Sam. He’s so adorable and was such a trooper in that cold air! Hi friends! I’m sharing one of my favorite families on the blog today! I went to high school with Kelly and Karen and these two sisters quickly became two of my closest friends. Kelly is a year older than me and Karen and I graduated together. They both stood beside me at my wedding! Hey everyone! Happy Friday! I am so glad the weekend is here! This is my last weekend before my busy season begins and I am going to soak up every second of it with my family! But… Oh friends, I have more fall family photo goodness for you today! Meet the Middleton’s (and yeah, mom’s name is Katie so that’s super cool)! They are perfection! This super sweet family is so beautiful and the kids were so good, and so stinkin’ cute! The two oldest were Emily and Thomas, which was so easy for me to remember because my best friend’s name is Emily and her husband’s name is Thomas! Good morning, friends! Happy April! I'm so happy spring is here. I love my boots and scarves but I'm ready for the warmer weather and pretty blooms. Today I'm sharing the Weaver family with you guys! I adore this sweet, fun little family! I've taken their family photos for the past three years now and I love seeing little Leah grow. She has the best personality! The Weaver family always includes their handsome puppy dog, Murphy in their family photos as well. They are the absolute cutest! Oh my goodness! How is March already coming to an end? Happy Friday, you guys. I am so excited for this year. My second shooter and I have been taking the off season to step back and look at what we've been doing, how far we have come, and we have been taking education classes so that we can continue to give brides and grooms, families, and seniors the best photography experience and photos that we can provide. I am a firm believer that we can never stop growing and learning. So get ready, 2018! It's about to be an incredible year! But enough of me! Today I'm sharing the McCoy family with you all. I actually shot Sam's maternity photos and I was so excited when she reached out to me to take family photos and one year photos of sweet little Henry! Oh, I just love these guys! Sam brought along some props and we just set up shop in Blacklick Park and had so much fun! I love seeing Sam and Josh as parents now, with Henry on this side of Sam's belly! The way this family looks at each other is so warm, you can see there is so much love between the three of them!